VATICAN CITY (CNS) — The church — from individual parishes to the Vatican — needs to collaborate with highly skilled specialists if it wants to get serious about evangelization, said a Canadian media, design and marketing entrepreneur. While church leaders should turn increasingly to lay experts, lay Catholics should “step up a lot more in our parishes and our dioceses,” offering their expertise, Matthew Harvey Sanders told Catholic News Service July 14. 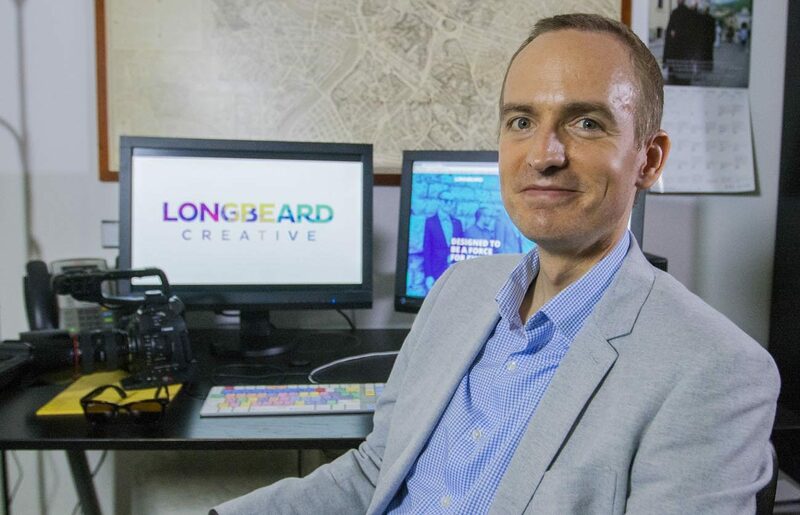 The 34-year-old Toronto native is the founder and managing director of Longbeard Creative, a web and graphic-design company that works with nonprofits. Sanders was in Rome in mid-July meeting with current and potential clients, explaining to church leaders the benefits of allocating resources to digital tools and innovative outreach. Many secular brands, products and services are successfully using today’s tools and marketing strategies to capture people’s attention, Sanders said. “If you imagine yourself in Times Square, there are hundreds of conversations going on around you, you look up and there are all these screens, bombarding you with information and advertising, selling you a lifestyle,” he said. But “if you ask someone in Times Square ‘Where’s Jesus in this mix?’ Maybe, ‘Ah, it was that guy on the soapbox, right? Who’s talking about the fact I’m going to hell,'” he said. “If we really want to capture people’s attention, we need to focus on putting together visuals, video and digital strategies that are as good” as what the secular world is using, he said. The Catholic Church does not have to lose its Gospel message or its Christian identity, he said, while it takes advantage of the many insights and skills available in the secular world. But it does have to compete with a very crowded market, making it “an enormous undertaking that’s going to require a lot of collaboration,” he added. If one looks at the church’s message, gifts and teachings, “the church has a great product, one that people really need. The fact is most people are so busy and distracted they don’t even know they need the product,” Sanders said. Major franchises, for example like Star Wars, spend nearly as much on marketing their work as they do on creating it, Sanders said. As a result, “you don’t need to explain to anybody what Star Wars is.” But church organizations do not invest very much in digital media and promoting their work, especially when compared to what most companies spend. Sanders, who worked for the Archdiocese of Toronto as executive assistant to the chancellor, praised the Vatican’s latest appointments of two highly experienced laypeople to lead the Vatican press office and three new lay members joining the Vatican’s Secretariat for Communications. “I think the governing bodies of the Vatican — the various commissions and secretariats — I think they need to involve a lot more laypeople,” including having more women to better reflect the makeup and kind of expertise present in society, he said. “If the Vatican really wants to get serious about evangelization, if it really wants to get serious about reaching people,” he said, it needs to tap into the many specialized fields and individuals out there. Sanders said the church’s success in spreading the Gospel has been based on its “very strong grassroots involvement” — its willingness and ability to engage with different people in effective ways. While a more centralized approach to communications may offer “more order and guidance,” it should not come at the expense of losing touch with people’s unique voices and situations or losing the agility to tackle diverse needs. Sanders, who was an infantry officer in the Canadian Forces for eight years, said something he carries over from that experience is the military’s belief in efficiency, allocating the resources necessary to accomplish its mission and a spirit of focused commitment. In the church, it’s “too easy to forget that when we’re passive” about engaging with the world or “when we ignore the problems, there is a cost,” he said.